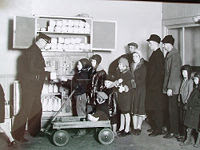 "Recent economic times may mirror what American grandparents or great-grandparents went through in the Great Depression. While this time may be a challenge, it may be an opportunity to look back and learn how previous generations coped with tough economic times. Hopefully, we'll never need to relive their lessons learned, but at the very least we can appreciate their resourcefulness and gain perspective on our own situations."